By Mary Ann DeSantis | Photography credits: Cedar Key Photos: Mary Ann & Tony DeSantis; Perdido Key Photos: VisitPerdido.com; Lido Key/St. Armands Circle photos courtesy of VisitSarasota.com. At Florida’s far western boundary lies Perdido Key, home to the state’s whitest sand thanks to the Gulf Island National Seashore. With azure water and a name like Perdido Key, people often think this island is in south Florida, but it’s actually a few miles from Pensacola via Highway 98 and the famed Blue Angel Parkway. In Spanish, the name Perdido means “lost,” and indeed this island is the place to lose your cares and stress. 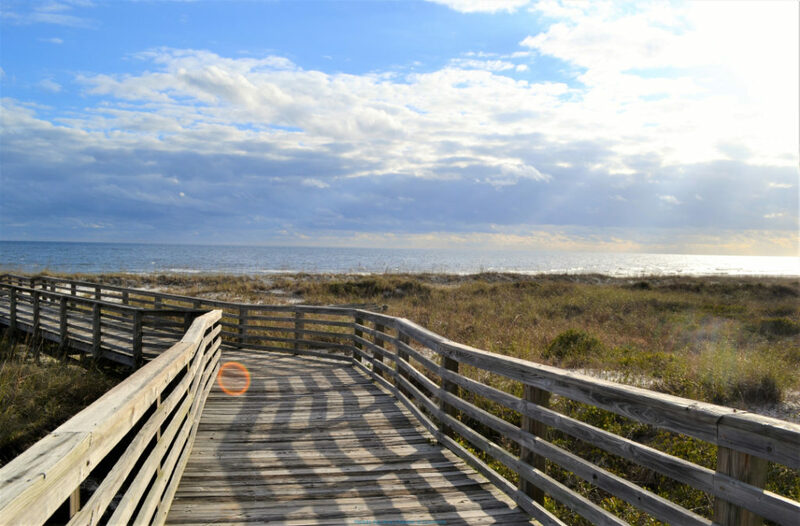 In addition to beach time at the pristine Johnson Beach on the National Seashore (where a weeklong pass is $15 for a carload), outdoor enthusiasts will find miles of hiking trails at Big Lagoon State Park and Perdido Key State Park. The Perdido Kids Park also keeps the little ones entertained. Fishing, kayaking, and beach exploring are the biggest draws to this 16-mile strip, which USA Today named “Best Beach in Florida” in 2015. Perdido Key is often mentioned in the same breath as the legendary Flora-Bama Bar & Restaurant, which sits on the Florida-Alabama state line. Open since 1964, the Flora-Bama has been the setting for songs and books, but it’s the oysters and live music that make the waterfront grill a memorable stop. If you grow weary of seafood, head to Jellyfish Restaurant on the second floor of the Villaggio Shopping Center for the smoked meatloaf. While the seafood, fish tacos, and fried green tomatoes at Jellyfish are awesome, it was the meatloaf that my family talked about long after we were home. In Case of Rain: While the beach is the biggest draw, Perdido Key has plenty to do when you want a beach break or if it rains. The National Naval Air Museum, just over the bridge toward Pensacola, is a must-see, especially for Blue Angel fans. In fact, check the schedule because the elite Navy flying team practices on Tuesday and Wednesdays at 11:30 a.m., and admission is free for both the practices and the museum. Where to Stay: Perdido Key doesn’t have chain hotels. It’s mostly vacation rentals and AirBnBs. Contact Perdido Key Resort Management. The Cedar Keys – a cluster of small islands – epitomize the area’s nickname ‘nature coast.’ Hiking, birding, fishing, kayaking, and just enjoying the outdoors bring people to the area all year. The area has become a source of inspiration for Florida wildlife photographer Richard Wise, owner of NatureWise Photo Images. The historic town of Cedar Key is actually located on Way Key, the largest island in the Cedar Keys cluster that are located on Florida’s Big Bend. The town is one of Florida’s most vibrant arts communities with an array of galleries, including a quilting shop. My first stop is usually the Cedar Key Arts Center, an artists’ co-op that features an eclectic assortment of vases, jewelry, fiber arts, paintings, photographs and more. A trip isn’t complete without tasting Cedar Key’s signature dish: clam chowder. In 2009, Tony’s Seafood Restaurant won the Annual Great Chowder Cook-off in New England. Amazingly, Tony’s Cedar Key Clam Chowder beat the New Englanders again in 2010 and in 2011, and won a chance to retire the recipe in the Cook-off Hall of Fame. For a behind-the-scenes look at Cedar Key’s clam industry, sign up for the “It’s a Whole ClamLife Tour” at the Southern Cross Sea Farms on State Road 24. Tours begin at 1 p.m. on Fridays from November through May. In Case of Rain: Duck inside the Cedar Key Historical Museum and you’ll understand the town’s importance to Florida history. Many people are surprised to know the Civil War reached Cedar Key when Union troops blockaded all of the Cedar Keys and a battle occurred on the mainland. Later, two pencil companies were drawn to the area because of the numerous cedar trees and established saw mills. Red cedar slats for pencils were shipped to pencil companies in the North and in Europe. The most important development may have been the formation of the Cedar Keys National Wildlife Refuge in 1929. Today, the area is known for its pristine wetlands and wildlife as much as it is for food, art and tourism. Where to Stay: The Island Hotel, built in 1859, is chock full of history, maybe a few ghosts, and an exquisite dining room serving some of the best seafood on the island. Jimmy Buffett even played there during his early days in Florida. Another option is the charming Cedar Key Bed & Breakfast. Circus magnate John Ringling named the key because he was such a fan of Italian culture and the Italian word “lido” means beach. It’s hard to miss the Italian Renaissance influence that Ringling loved. More than 30 marble statues circle the St. Armands area, which Ringling designed in the early 1920s as a planned development community. The 1929 stock market crash interrupted Ringling’s plans, but the area has become one of Florida’s most beloved destinations. Today, Lido Key is known for eco-tourism and sunset cruises as well as white sand beaches. It’s the place to go for deep sea fishing, dolphin watching and sailing. And when you are tired of the beach, don’t miss the shopping on St. Armand’s Circle. Be sure to try the fabulous restaurants, including Florida’s iconic Columbia Restaurant established in 1905 and known for its Spanish/Cuban cuisine or the Crab & Fin for its fresh, local seafood. In Case of Rain: Cross back over the Ringling Causeway to the Mote Marine Laboratory & Aquarium. Founded in 1955, the aquarium features touch tanks, a 135,000-gallon shark habitat and laboratories where visitors can see scientific research in action. Or head a few miles north to the DeSoto National Memorial in Bradenton where you can try on period armor and see artifacts from Hernando de Soto’s 1539 landing in Tampa Bay. This national landmark commemorates the first major European exploration of the South. Where to Stay: Lido Key has a variety of accommodations including hotels and vacation rental properties. Both Sandcastle Resort and Lido Beach Resort offer private beaches on the Gulf as well as other resort amenities.